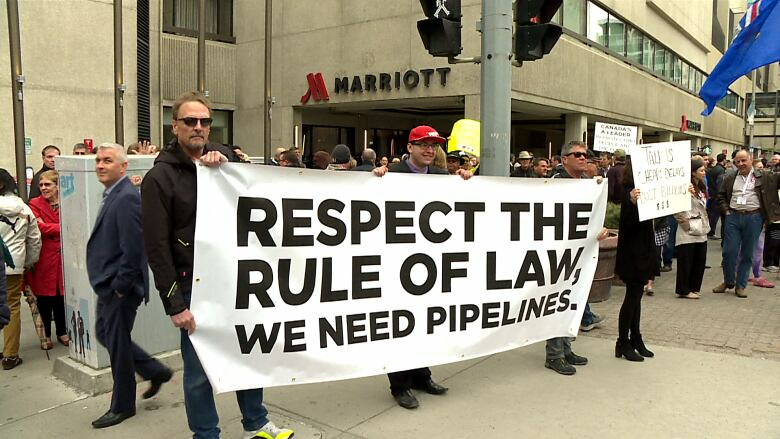 Pipeline supporters and opponents held side-by-side rallies outside a downtown Calgary hotel Wednesday, where Enbridge was holding a shareholders meeting on the Line 3 pipeline replacement project. Calgary police estimated about 200 people attended the duelling protests, the majority of whom were pipeline supporters. "I know a lot of people that have lost work including my husband," said Victoria Wallace, a geologist with an oil and gas company who attended the rally. "I think it's important for Canada's economy overall." The pipeline replacement project is intended to run between Alberta and Wisconsin. While it has federal approval in Canada and a presidential permit in the U.S., it's being held up by state regulators. In April, a judge gave a conditional green light to the project, as long as the company follows its existing pipeline corridor — not a planned new route — and replaces the current pipeline as opposed to abandoning it. Wallace called the counter-protesters stances "ironic." "We're importing a lot of oil and gas from countries that don't have very good human rights and Canadian oil and gas is very ethical," she said. 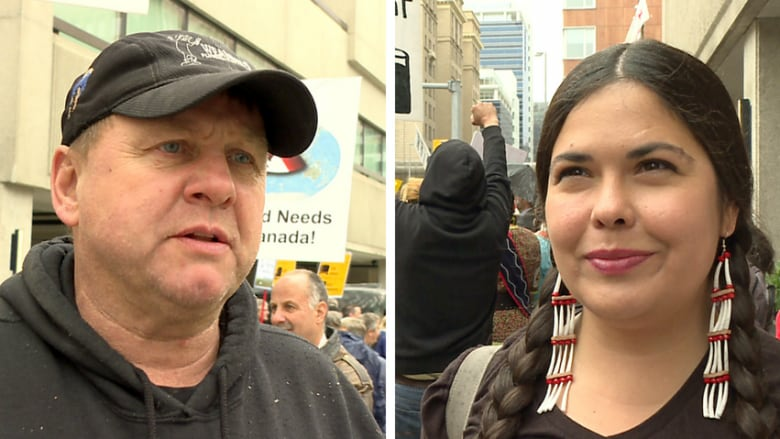 Tara Houska, the national director for Indigenous environmental group Honour the Earth, said the hostility pro-pipeline protesters brought to her group of about 30 anti-pipeline advocates was "unfortunate and very disappointing." 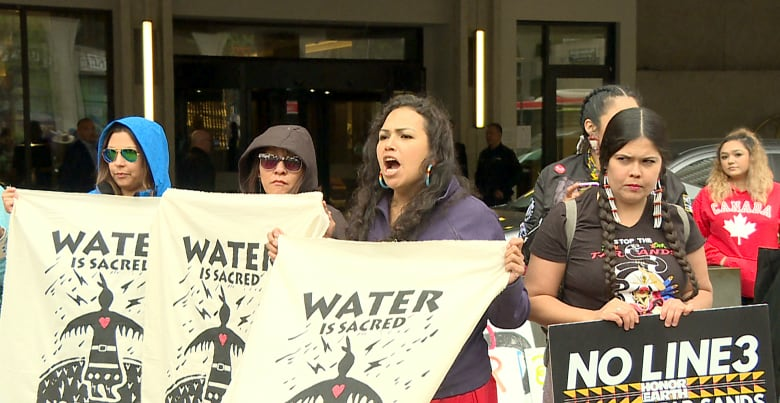 Houska, an attorney from Couchiching First Nation in Minnesota, attended the meeting as a proxy shareholder. "They have a very bad spill record," she said. "Enbridge is responsible for the largest spill in U.S. history. We look at something like that and we're talking about it going through protected watersheds, untouched areas. It's terrifying, frankly. "As Native people it passes through our wild rice beds, our wild rice is sacred to who we are." Another pro-pipeline protester, Brian Wimmer who owns a plumbing business in Didsbury, Alta., said he was there to support pipelines not only for oil and gas jobs, but for how much they bring to Alberta's economy as a whole. "Over the last 20 years, if there wasn't oil and gas we wouldn't have been that busy," Wimmer said. Houska pointed to the fact that the jobs impacted by Line 3 would largely be south of the border, and argued there are better ways to keep the economy afloat. "We want them to have jobs, we want jobs for working class people. But I want them to have jobs that are not going to destroy our environment," she said.